What to impress your dinner guests this holiday season without creating annoying work and stress? You can even employ your in-home elves and get the kids into the act if they’re able follow simple directions and fold a napkin. 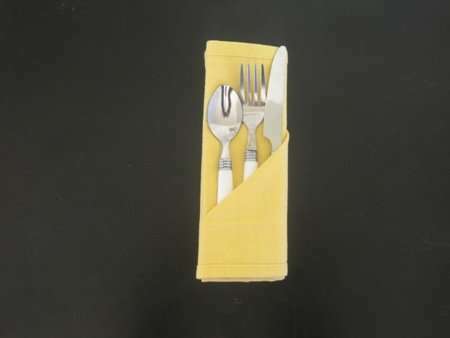 If I was able to easily do the following holiday napkin folding, I know you can too. 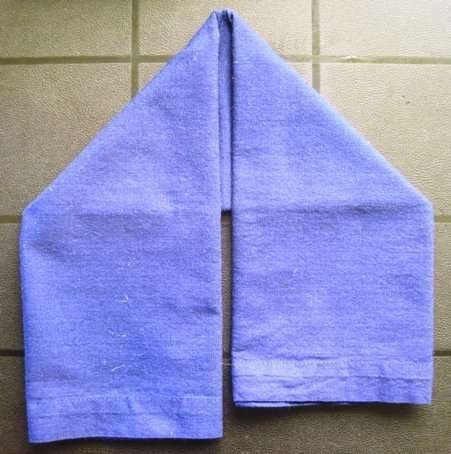 In fact, if you have fancy-schmancy napkins, I bet you can make better ones than I did. And if that’s the case, I want to see! 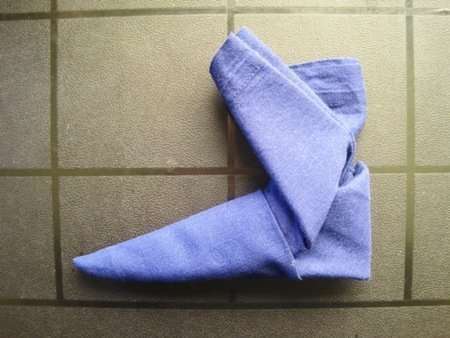 The pictures of folded napkins included in this post are of the ones I made, proving that I actually did them. Plus the directions I give below are basically what I said out-loud to myself as I did the folding. So there! 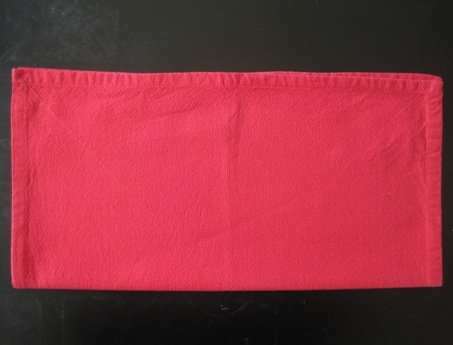 Place a square napkin flat in front of you, with the “inside” of the hat facing up. 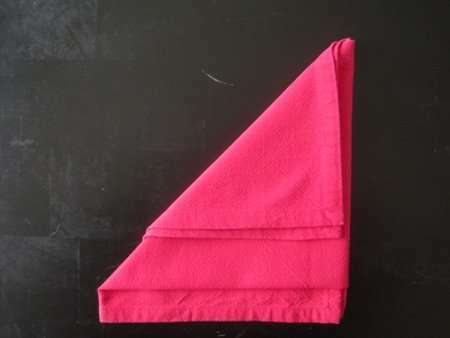 Fold the napkin in half by bringing the bottom edge up to meet the top edge. 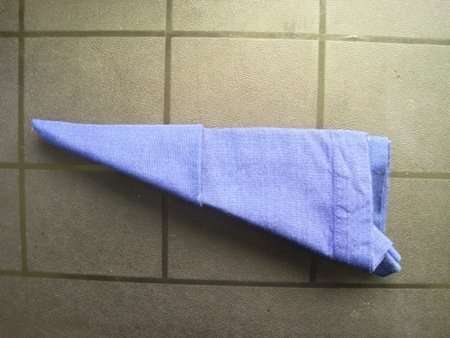 Grasping the top right corner, make a diagonal fold, bringing the edge about an inch past the center crease. 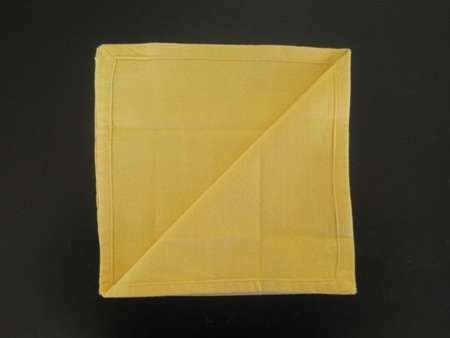 Take what is now the bottom right corner, and fold the napkin to the left, at the center crease. 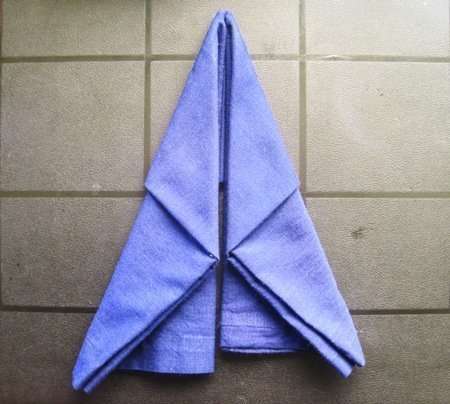 Grab the top right corner and fold the napkin down to make a large triangle. Put your newly created Santa Hat Napkin on a plate and garnish it with a little gift inside for your guests, and voila! 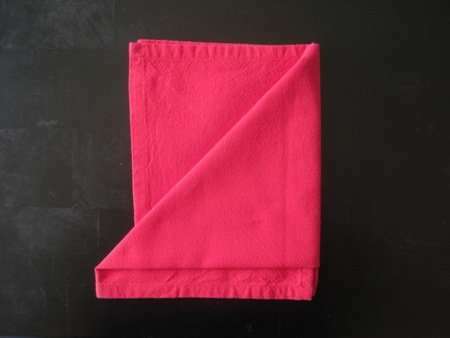 With a square napkin flat in front of you, fold the bottom edge up to meet the center. Repeat with the top edge. Fold what is now the top edge down to meet the bottom edge. You should be left with horizontal rectangle. 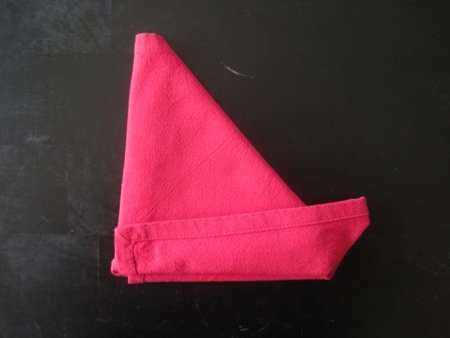 Place your finger at the top to hold the napkin steady, and fold down the right side to make a diagonal crease. Repeat with the left side, making sure that the bottom edge of the left side goes past the bottom edge of the right side. Some adjustment may be needed to create the result you need. Also be sure there is about a finger-width space between the center edges. 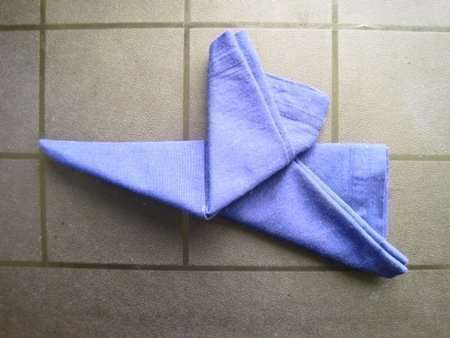 Fold each side in towards the center to make two thin triangles. 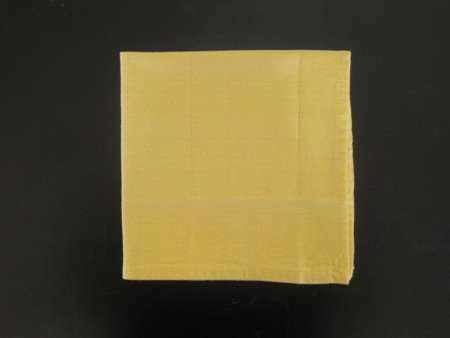 At this point, it might be a good idea to give the napkin a quick press with a warm iron. 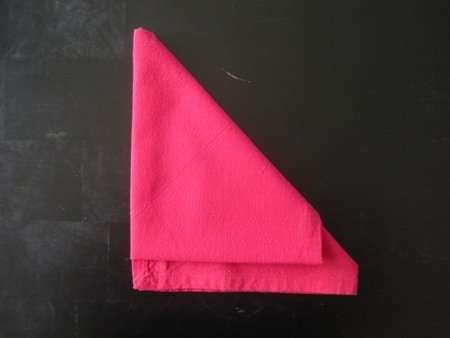 Fold the two halves to meet each other so that the right side is on top of the left side, and rotate the napkin a quarter turn to the left. 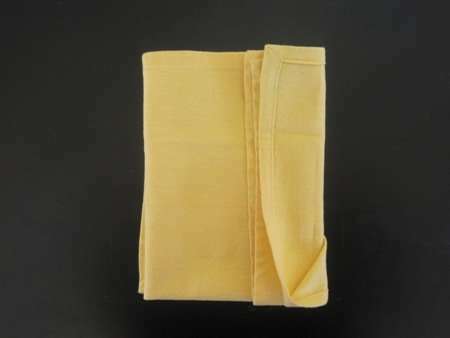 The point of your folded napkin should now be on the left. Take the loose bottom section on the right in your right hand, and fold it up to meet the center edge. 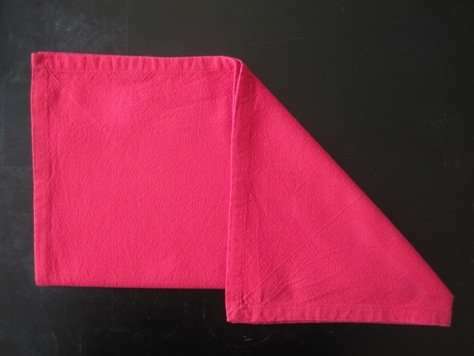 Fold the top right corner of the bottom piece down and it tuck into pocket on the right, made by your fold in the previous step. Set it upright on a plate and you’ve got a darling Elf Boot Napkin! This one is super easy, and adds a touch of elegance to any dinner table. Start with the napkin flat in front of you, face side down. 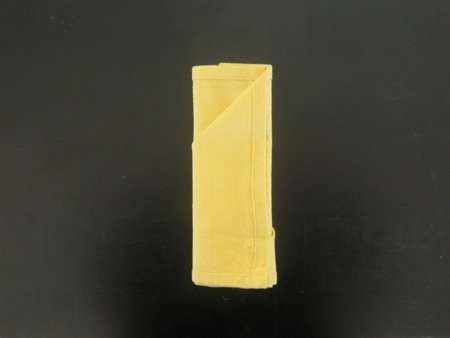 Fold it into quarters, making a square. Rotate the square so the open ends are at the top left corner. Taking hold of the top piece only, fold it down diagonally to meet the bottom right corner. 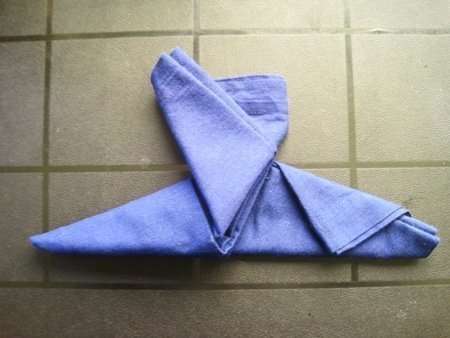 Flip the napkin over and fold into thirds towards the center. Flip it over again and insert your silverware. Do you have any holiday napkin folding ideas? I would love to hear them!! Leave your thoughts and ideas in the comment section below. 50 queries in 0.899 seconds.